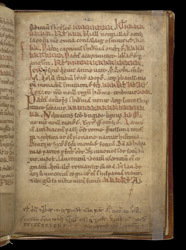 Entries on this page record milestones of St Patrick's story: captured in Britain, brought to Ireland as a slave, freed from slavery, returned to Britain and then returned to Ireland to baptise the Scotti, as the early Irish were known. Just below the entry on Patrick baptising, the birth of St Brigid, another of the patron saints of Ireland, is recorded. Also appearing are the rise of Laegare Mac Neil to the Irish kingship, the martyrdom of St Lawrence in Rome, and the martyrdom of Pope Sixtus II--the last two chronologically out of place with 5th-century Irish events. The letters 'K' express the date, using a version of the Roman system of kalends.